Amazon.com description: Product Description: As a 'Specialized Agency' of the UN, the World Intellectual Property Organization aims to be the premier global forum for intellectual property services, policy, information and cooperation. Whilst many individuals, firms, institutions and governments know and use WIPO services, the ways in which it functions, how priorities are set and decisions made are less well-understood. Indeed, a diversity of WIPO's stakeholders and member governments express frustration that WIPO's governance is not only complex but at times opaque. - Transparency and external relations. The text is accompanied by a number of valuable appendices, including key documents that have, to date, not been readily available to the public. 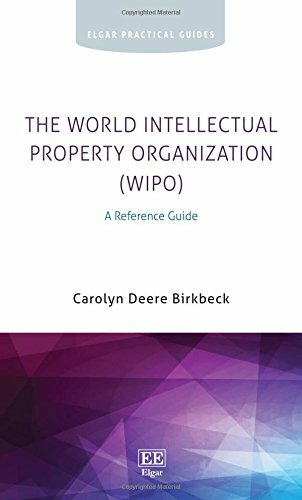 Written by a leading WIPO commentator, The World Intellectual Property Organization (WIPO): A Reference Guide is the first comprehensive reference book to illuminate the nuts and bolts of WIPO governance. It will prove an invaluable and handy resource for those who interact with WIPO on any level, as well as to researchers seeking an introduction to how the organisation works.